Yes, the Youabian Puma is certainly in class by itself. In fact, L.A. Auto Show organizers asked that it be parked it off by itself too. 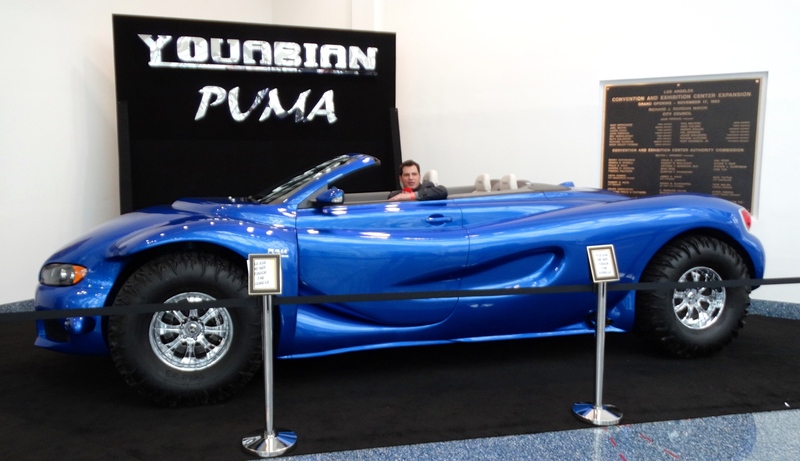 This is the most unusual vehicle at the 2013 L.A. show, by far. The company, headquartered in Los Angeles, where the car “was conceived, designed, engineered and built,” is available for a cost of – what for it – “one million dollars!” No wait, sorry Dr. Evil, that’s $1.1 million with various add-ons, as pictured here. The company claims it has received “multiple orders” already. “It incorporates the most technologically advanced features offered in the automotive industry, along with a fully automated convertible top,” the company says. Just ignore the parts bin General Motors gear, such as the late model Buick headlights or the LS7-based 505-horsepower V-8. Your mileage may vary, but it is supposedly rated at 14 m.p.g. city, and 22 highway. I am unable, despite looking at it from several angles, to see any resemblance whatsoever to a puma. « Where Was LAST VEGAS Filmed? Not Vegas?! ?